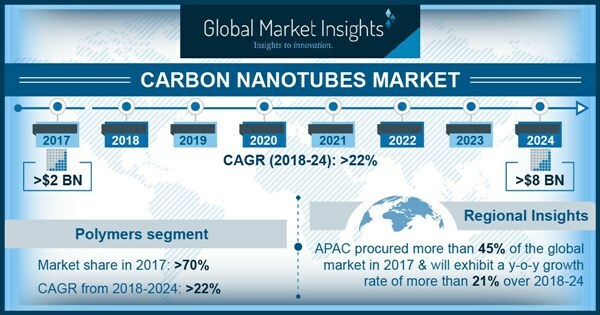 Carbon Nanotubes Market will surpass USD 8 billion by 2024; according to a new research report by Global Market Insights, Inc.
Polymer based nanocomposites are an ideal solution for a new generation composite materials. They have wide applications in automotive, transportation, aerospace, energy, infrastructure and sporting goods sectors. For instance, Nanointegris, the subsidiary of Raymor Industries, Inc. had a remarkable innovation in polymer-wrapped, ultra-high-quality semiconducting carbon nanotubes (CNT) in powder or solution forms with purity around 99.9%. Moreover in 2014, OCSiAl a leading industrial player had projected a strong potential for CNT in building NASA and Google-X’s space elevator using carbon nanotubes, as proposed by CEO of SpaceX Elon Musk. Cnano Technology Limited a manufacturer of multi-walled carbon nanotubes for electronics industries and the energy storage had received USD 15 million funding from investors in 2015. The company has been using the funds toward expanding its products to meet the high-end consumer battery market with their lithium-ion battery products. Such trends represent that CNT market shall have bright future in energy application which is likely to generate higher returns on investment during the forecast timeframe. Global carbon nanotube market has been challenged by high operational cost owing to multiple purification process of carbon nanotubes. In addition, high price of hydrocarbon has been negatively influencing the global carbon nanotubes market. Thus, the market size will be restrained by complex manufacturing process and high operation cost in the next decade. Multi-walled carbon nanotubes held the highest share in global nanotubes market by the end of 2017 with a market share exceeding 75%. This segment is likely to observe a similar trend by 2024, for their unique performance characteristics. For instance, the atomic bonds of multi-walled carbon nanotubes are highly strong which allow them to withstand extreme temperatures. Multi-walled CNT have been good thermal conductors properties; also, compared to copper wires these multi-walled carbon nanotubes can transmit around 15 times the amount of watt. Energy segment has CAGR close to 23% of carbon nanotubes market. CNT finds significant applications as electrochemical capacitors for energy storing devices. These energies storing devices will hold significant demand in electric vehicles, renewable energy, mobile devices and uninterrupted power supplies by 2024. Carbon nanotubes have been effective as electrochemical capacitors on account of their features including: good conductivity, chemical stability, large surface area, etc. They offer strongly entangled network which allows the capacitor to deposit metal oxides thus enhancing the performance of capacitors. Global carbon nanotubes market was led by Asia Pacific with a market share exceeding 35% in 2017. The region was led by China in the same year, as it has been one of the leading market for electric vehicles. These vehicles have significant usage of carbon nanotube as electrochemical capacitor for energy storage. In addition, countries such as India, Indonesia and Malayasia have been witnessing strong growth in electrical and electronic industry owing to rising disposable income and social economical factors. Leading market players of CNT market have been engaged in production expansion and research & development activities for offering technologically advanced products to several end-users industry. Prominent players of the market include: Continental Carbon Nanotechnologies, Carbon Solutions, Arkema SA, Nanocyl SA, Nanoshel LLC, Hyperion Catalysis International, Future Carbon GmbH, Raymor Industries Inc., Klean Commodities, Korea Kumho Petrochemical Company Ltd etc, Raymor Industries Inc, etc. There are other small and medium-scale market players which contribute towards market growth and play significant role in industrial value chain.